This Saturday night. 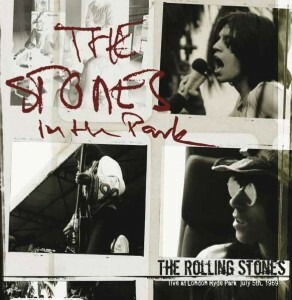 7pm UK, NY & SF is the Rolling Stones, live in Hyde Park, July 5th 1969! One of the most highly anticipated gigs of 1969, the Rolling Stones‘ free concert in London’s Hyde Park on July 5 delivered on all the promise and then some. Having taken two years off from the road, the show was conceived as the beginning of the band’s big return to the live stage. The evening was also planned as an introduction of their hot new guitar player, Mick Taylor. A former disciple of British blues legend John Mayall, Taylor had been inducted into the Rolling Stones just a month prior, after the band had decided to finally wash their hands of the supremely talented but increasingly erratic Brian Jones. As the Hyde Park show drew nearer and nearer, the group got into playing shape by rehearsing at the Beatles’ Apple recording studio on Savile Row. Then like a lightning bolt came the bad news no one was expecting. On July 3, 1969, Brian Jones was found dead at his home outside of London. As you might expect, the band was equal parts shocked and horrified by the news. Rather than cancel their upcoming concert however, they decided to carry on and reformat it as a tribute to their ex-band mate. More than just another show, the Hyde Park concert was an event. Estimates put the crowd as large as 500,000 people who showed up to take in the spectacle. Opening for the Rolling Stones was a melange of fantastic British acts including King Crimson and Alexis Korner’s latest outfit New Church.